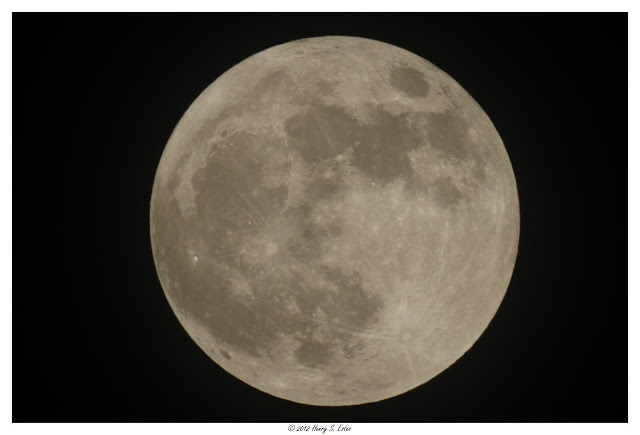 Full Moon captured last night, May 5th, 2012. This Super-Sized Moon was all due to proximity to our planet Earth. The moons average distance is 237,102 miles. Last night is was 221, 308 miles - hence the larger diameter, and great luminance. The next time it will closer will be November 15, 2016 - mark you calendars! All orders printed on Metallic paper, without border or watermark. Note - some cropping may occur in final printing. Other sizes and printing options are available. Please contact me for more information.